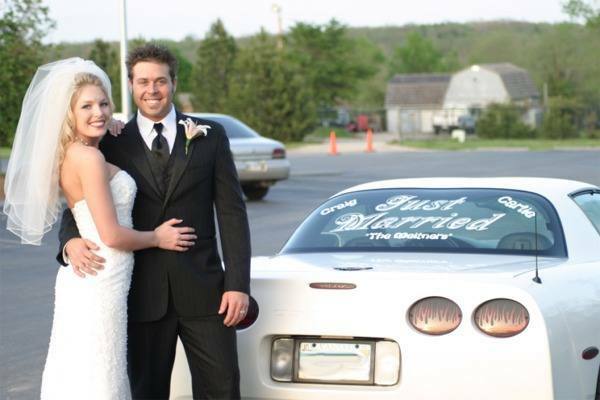 Get your custom made "Just Married" decal here. You pick the font you want used along with the size and color. This can be ordered from the Custom Lettering form. Add that special class to the bride and groom's chariot as it leaves the church. No messy shoe polish to get on the cars paint or clothing. Since it is installed on glass it can be scraped off with a razor blade in a matter of seconds. Installation can be done in just a few minutes with just one or two people using tape and scissors. Additional small custom lettering can be added with the bride and groom's name. In the image below the second line was used for "Married". Using the 2 line option works best on taller back windows. Trucks look best with all the lettering being on a single line. The names were separate decals made with a "fun" font and just applied after the main decal was installed.